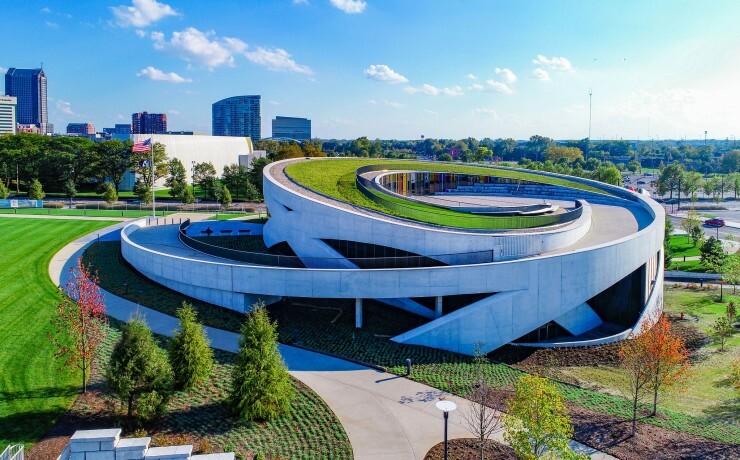 Our club has arranged an opportunity for you to tour the brand new National Veterans Memorial and Museum in downtown Columbus on Saturday, May 18 at 2:30PM. This is one of the few national monuments outside of Washington DC – our late senator / astronaut John Glenn was instrumental in building this special tribute right here in Columbus. The museum opened in late October of 2018, and is a living tribute to the over 40 million Americans who have served this nation since its founding. It is a beautiful addition to the downtown Columbus landscape. If you are a dues-paying member of the Franklin County OSU Alumni Club, you may join us at the member price of $7 / person. If you are not sure whether you have contributed dues for 2019, please email us at OSUAlumniFranklinCounty@yahoo.com and we will be happy to check for you. We are also offering this opportunity to non-members of our club for just $10. Both prices are well below the museum’s group rate, and our club will be off-setting the difference. Best of all, Veterans are admitted free! We do need an accurate headcount so they know how many tour guides to provide. So please reserve your space by using the links below, or by sending your name, phone number, and email address, along with a check (made payable to Franklin County OSU Alumni) to Leyla Hawkins, 1149 Tillicum Drive, Worthington, OH 43085. If you have questions, please email us or call Leyla 614-893-0559. Veterans, please email us to reserve your free admission ticket. Just send us your name and phone number so we have an accurate number of people attending. How many tickets for non-veterans would you like? Save the date! Saturday, June 22 we will hold another one of our famous Social Committee meetings, to plan our activities for the remainder of the academic year. We had so many great ideas come up at our last meeting, we haven’t had time to schedule all the cool events suggested. So at this gathering we will plan out the spring and summer months with as many exciting events as possible. The location this time is Matt the Millers Tavern, 1400 Grandview Ave. There is parking on both sides of Grandview Avenue, in Matt’s own lot and in a public lot across the street. Starting time 4:30 pm (after the basketball game). We’ll have some snacks during the meeting, then dinner afterwards. Join us for a good time and to share your great ideas! RSVP by emailing us at OSUAlumniFranklinCounty@yahoo.com with your name and phone number. What a better way to kick off Spring than to enjoy some Buckeye Football!! The Scarlet vs. Gray spring football game will be on Saturday, April 13 this year. We’ll order a block of tickets, and we’ll host our traditional tailgate party. Game time is noon, and the tailgate will begin at about 9am. You can order your tickets now! For only $10 per person, this includes your game ticket AND all the food and beverages at the tailgate (rain or shine – we are “covered”), so bring the whole family! There will be cheerleaders, the Best Damn Band in the Land, and of course Coach Day will lead the team in putting on a “Show in the ‘Shoe”! 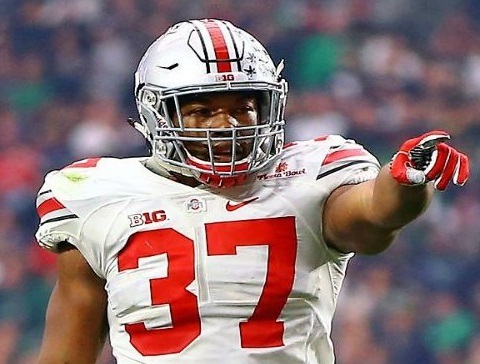 After the departure of several seniors, who will be the new breakout stars? DEADLINE TO ORDER WAS: WEDNESDAY APRIL 3. Save the date! Saturday, March 23: From 1 to 3 pm, we will assist Operation Buckeye with packing their boxes that are shipped to United States military personnel all over the world. Operation Buckeye has sent over 30,000 boxes of “wish list” items over theyears, to bring a touch of home and brighten the day of our soldiers everywhere. To learn more about this program and what they do for our soldiers and sailors, visit theirwebsite: www.OperationBuckeye.org. To participate in this event, please call or email Ron Kenat, 614-420-2736 or abelcom123@yahoo.com. He will add you to the roster, and we will send you directions to the facility. The Operation Buckeye headquarters is located at 5000 Arlington Centre Blvd. off Henderson Road in northwest Columbus, on the backside of the building and up to the 2nd floor. We will provide a map. This is a great family-oriented Community Service event that we support a couple of times per year — please join us if you can! We’re bringing back the Book Club with a cultural twist! Our club will be joining with the Asian-Pacific Islander Alumni Society to read and discuss “The Space Between Us” by Thrity Umriga, an OSU alumna from India who is now a professor at Case Western Reserve University in Cleveland. Our Franklin County club purchased a number of the books and distributed to those who wished to read it. We met with the API club members for dinner at an Indian restaurant on Thursday, March 7. 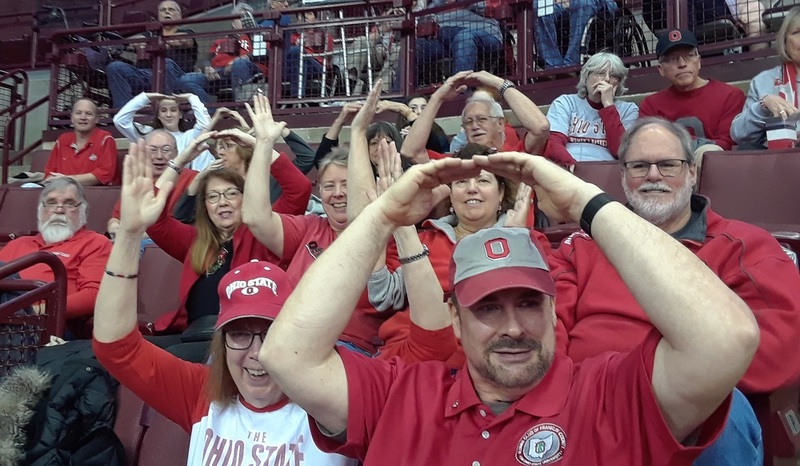 The Franklin County OSU Alumni Club will have a block of tickets to the Lady Buckeyes’ final weekend home game of the season, vs. Rutgers, Sunday, March 3, at 1:00 pm. We will host our usual “Tailgate” party in the Huntington Club (2nd level of the Schottenstein Center). We’re planning a visit to the Wexner Center for the Arts on Saturday, February 16 at 1 pm. Save the date — we’ll have a host giving us a guided tour. Our Alumni Club will even pick up the tab for admission and parking, so it is free for you! Parking will be in the Ohio Union garage, just a block from the facility. We will be seeing exhibits by Jon Waters and Peter Huber Photography. 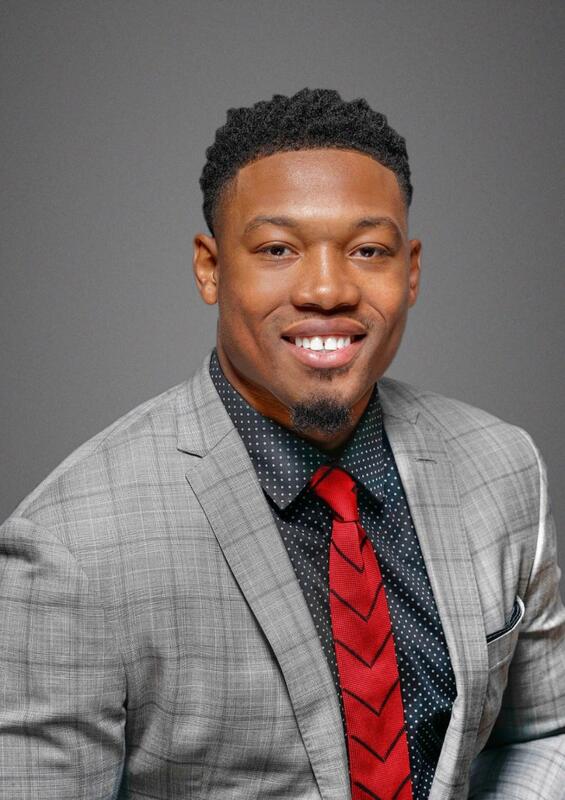 Join us for a very special event on Tuesday, Jan. 29, as we participate in the Student-Alumni Council’s “Dinner with 12 Buckeyes.” Limited seating available –sign up early! 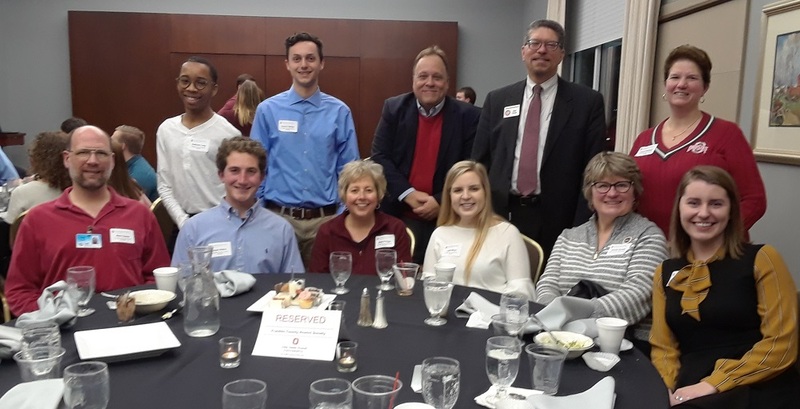 Created to foster friendships and networking opportunities between students and alumni, this event took place at the Longaberger Alumni House.